I've spent the last week or two providing medical support for an "expedition length" adventure race called the Subaru Primal Quest. It's been a remarkable time, fascinating from a variety of perspectives. I was out observing the ropes course and spoted this bumber sticker on a truck; I found it amusing, and reflective of a sentiment shared by more than a few of the atheletes participating in the race. 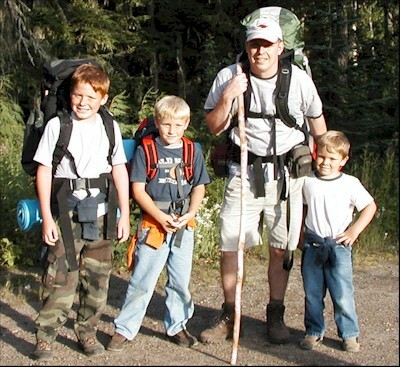 A couple of weeks ago the boys and I set out on our first true backpack-in campout. We got off to a late afternoon start and ended up walking for the last hour in the dark. Chase was not shy about letting us all know he did not like walking in the woods at night one little bit. This page is an archive of entries from September 2004 listed from newest to oldest. August 2004 is the previous archive. October 2004 is the next archive.